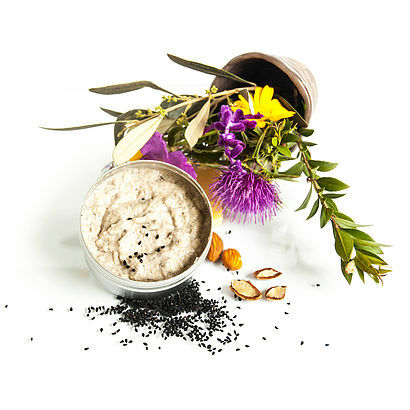 A unique combination of herbal and essential oils, bentonite clay, grains of Black Seeds and ground organic Olive Kernels. Gently polishes and exfoliates the skin, removes impurities and renews the skin for a healthy glow. Do not irritate the skin, contains anti-bacterial and antioxidant properties. Handcrafted. All Ingredients are Natural. Parabens Free. SLS Free. Petroleum Free. Not tested on animals. Environment Friendly. Sodium Oleate (Olive Oil), Sodium Cocoate (Coconut Oil), Sodium Castorate (Castor Oil), Sodium Palmitate (Palm Oil), Sweet Almond Oil, Shea Butter, Purified Aqua (Water), Avocado Oil, Jojoba Oil, Black Seeds, Grape Seed Oil, Olive Seeds, Black Seed Oil, Rose (Rosa Centifolia) Flower Extract, Vitamin E, Geranium Oil, Honeysuckle Flower Extract, Bentonite Clay. Massage gently onto wet face and neck, rinse thoroughly and follow with a nourishing Serum or Cream Butter.